My daughter is an ice skater so I made her chocolate cupcakes with butter cream icing – tinted to be lime green. 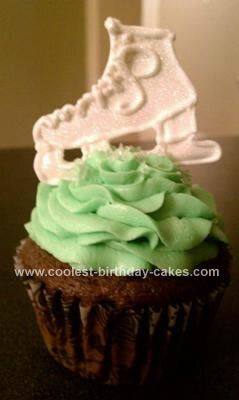 The ice skate is royal icing. To make the ice skate I traced a picture of a line drawing of an ice skate and then put it under a piece of wax paper. Then I traced the ice skate with royal icing (the royal icing should be stiff enough to make a good line). After the outline was made I put more water into the royal icing until it was the consistency of paint. Then I used a squeeze bottle to fill the icing. After the boot dried I retraced the boot with the stiff royal icing and added laces and finished it with luster dust so it would sparkle. Sounds hard – but it wasn’t – just takes time and a steady hand.